So I have fillet brazed the headtube in making sure i don’t pull the integrated headtube out of place. I also did the bottle mounts at the same time now iIhave a set centre line. Next brazing the dropouts onto the chain stays. I used a lugged bottom bracket to align the chains stays with an old axle through the drop outs to ensure they are straight. As quick tidy up and they are ready to be cut to length. I started mitre in the massive 35mm seat tube on the bottom bracket shell but came across some space issues with the bottom bracket vent holes (pre cut) and where the chains stays go on the other side. One of these you would be fine with both seemed to leave too little area for a good joint. I did a test braze joint and pulled it and it failed. better to waste some tube today than wreck a frame tomorrow. So I think I am going to default on the ISP part and just make a standard seat tube (it will be a lighter frame but maybe the same weight over all. I will take the rest back to the drawing board. Either design it in autocad or paper prototype the mitre. I have a spare BB shell that works with those chains stays so I will crack on on the next session. New build a fast road bike for myself. 58cm Columbus spirit frame with a a integrated seat post (ISP), that you sometimes see on carbon bikes. First I layout the full size drawing on the flat surface and check the parts are call correct and fit. 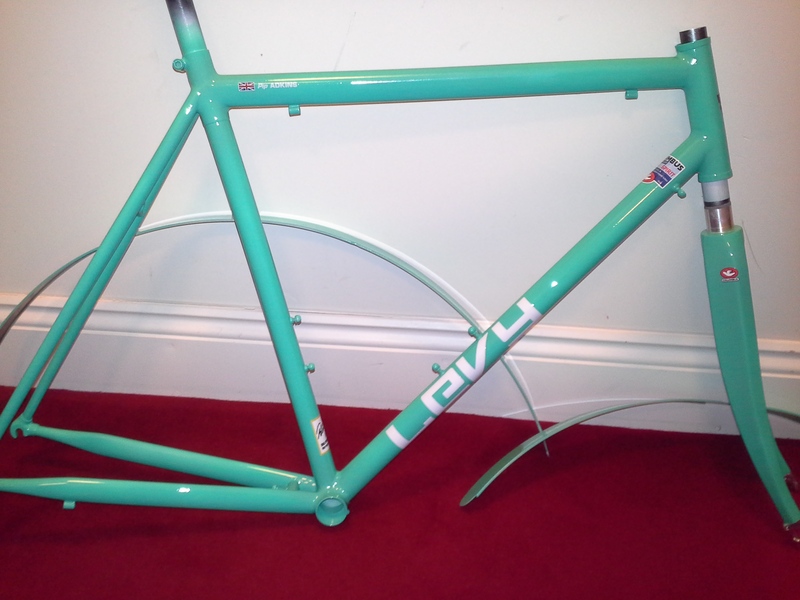 Next I start with the head tube, ream it. Then assemble the head stock with the forks and stem to check fit. Then i silver solder in the integrated headset cup and drill a vent hole. 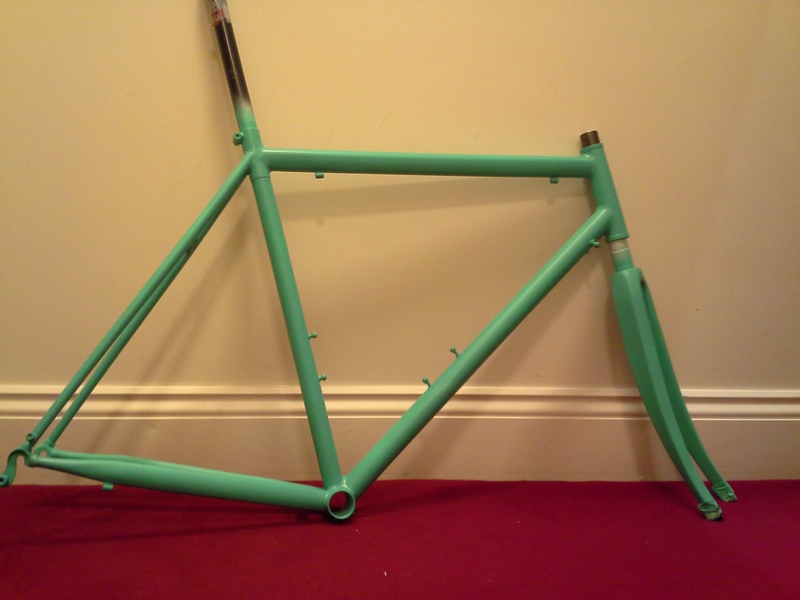 Next time, fillet brazing the head tube and frame ends. Hi Have just finished making at 1″ Pacenti fork. I figured no one has really made a fork like this for a while. Pacenti make the crowns in either 1″ or 1″-1/8th so i bough a couple of each. I thought i would build one and see if there is any demand for them. This crown was modeled after the very rare and highly sought after crown Tom Ritchey designed for Bridgestone many years ago. 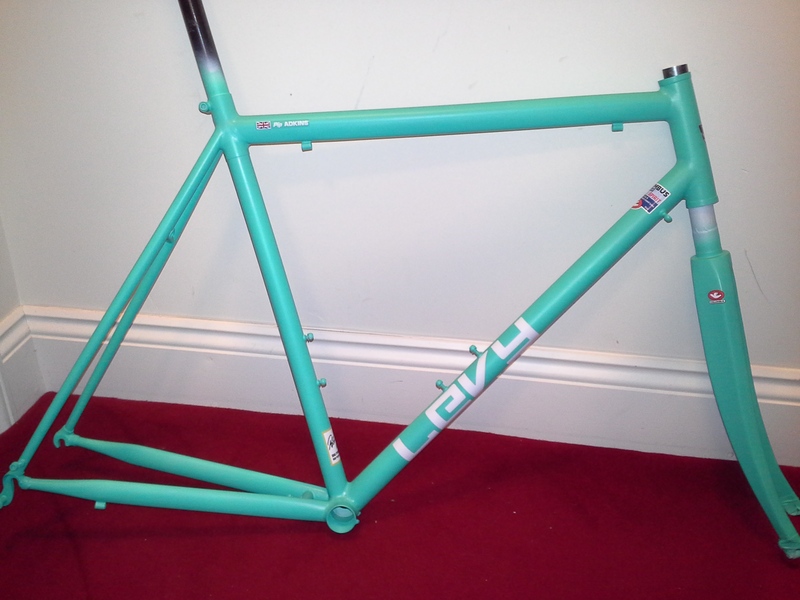 Kirk Pacenti updated and improved this crown for 21st Century framebuilders. 28 x 20 blades (Reynolds 531 fit perfect), 114mm wide, (94mm c-to-c) 74mm of wheel clearance, made for 1.” steer tube. 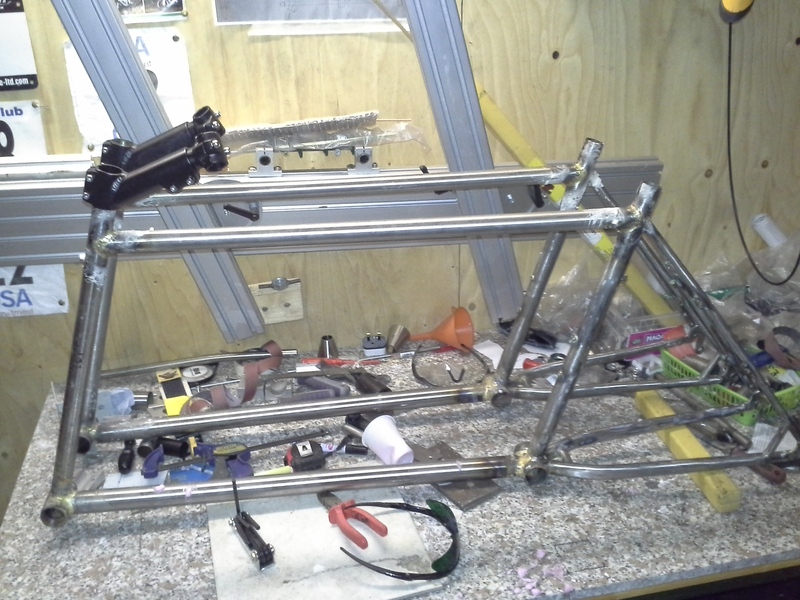 This on has Reynolds 531 fork blades, Columbus threaded 1″ steered (220mm), Saba canti bosses. Set to 395 mm axle to crown ( Non suspension adjusted). The crown is Silver soldered as the fit was so good and it take less heat. The ends were Sif 101 bronze as were the the canti bosses. 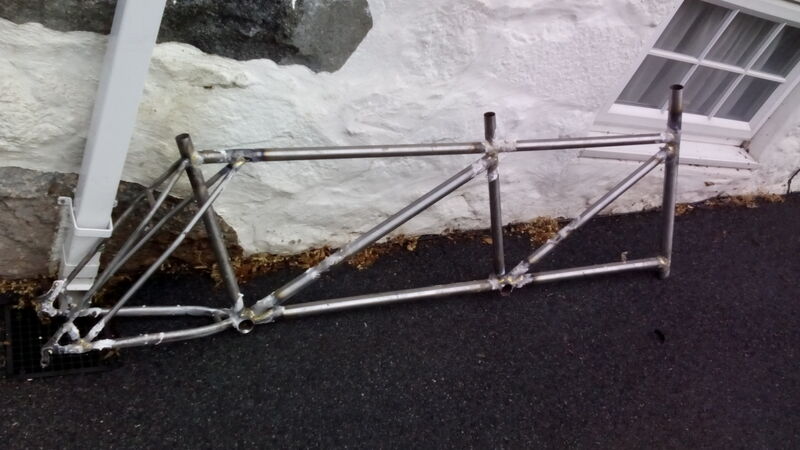 Finally i got round to building my on frame for once. 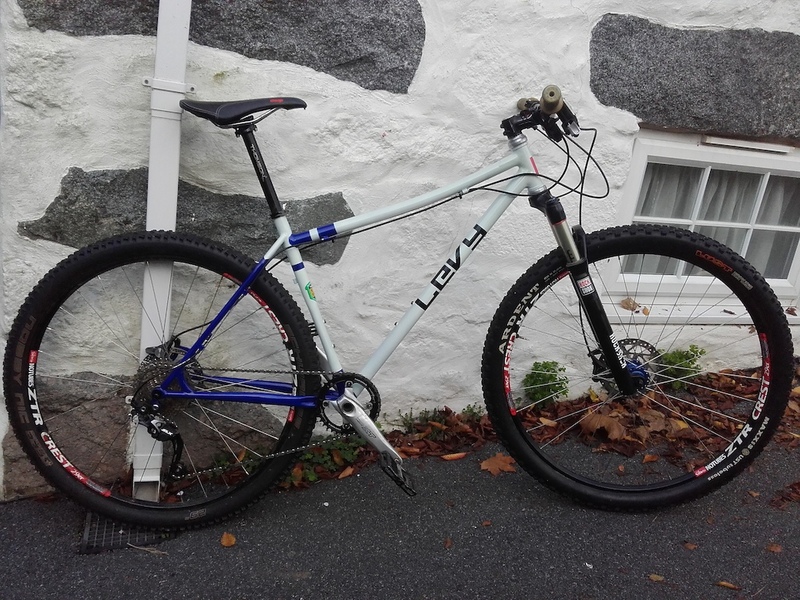 I wanted a steel 29er that i could use for racing and trail bashing/ night riding. So i went for a 69 Head angle and 74.5 Seat angle and short chains stays (hence the seat angle) and squeezed the seat tube to gain a few mm. I managed to get hold of some Reynolds steel 853 except the Columbus top tube (got some road 953 as well thanks to Chas Roberts recent move). The top tube is Columbus and i put a subtle curve in the top tube to give it a forgiving ride. I also went for a curved disk brake support at the rear and a matching on on the drive side which i tell myself is for controlling flex but it actually there to look more symmetrical. All fillet brazed even the Breezer rear dropouts that are normally TIG welded. Paint is from specialist paints with a blue pearl over white with a little surprise It glows in the dark!! 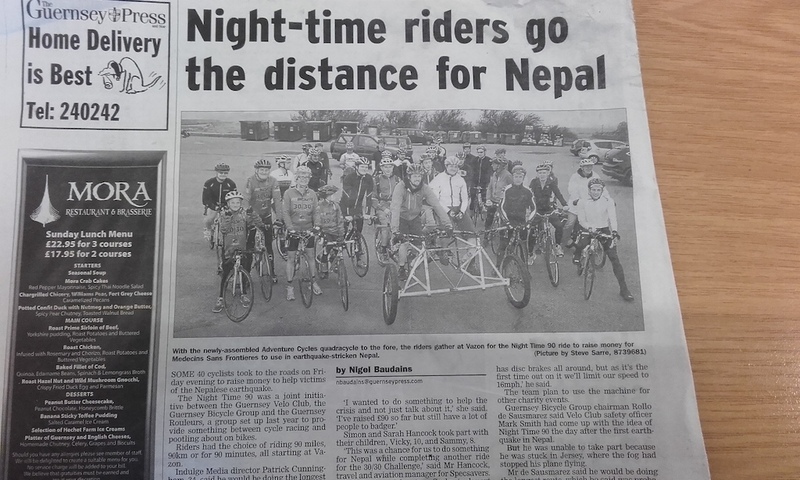 Last years Healthspan GBG night ride featured a contraption of 4 mountain bikes welded together with pig iron. It was a promotional vehicle that Adventure cycles used for fun events. 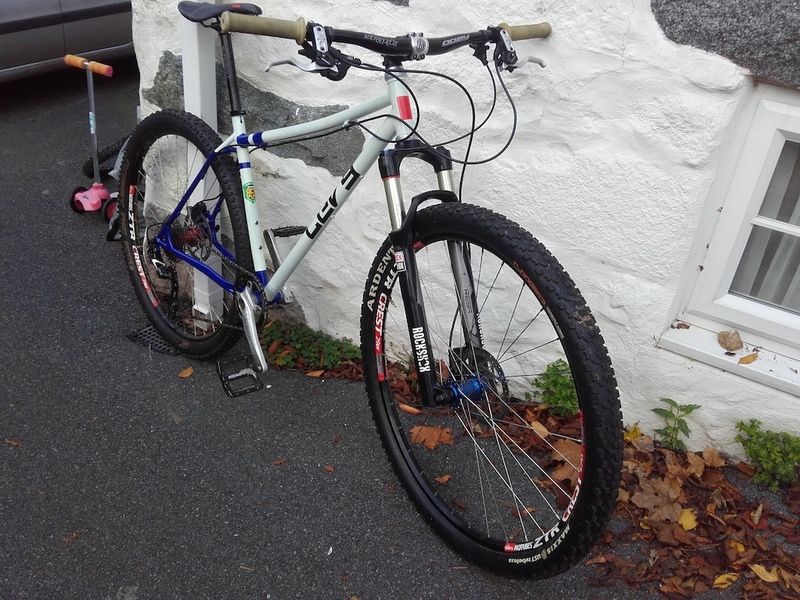 However on the nation hill climb “Val De terres” the bike handled badly and it was deemed too dangerous to keep using. In the mean time I had been in a hit and run and could not ride. So if I wasn’t riding maybe I could take on a bigger build. So Adventure Cycles commissioned me to build a Quadra cycle called the dominator. 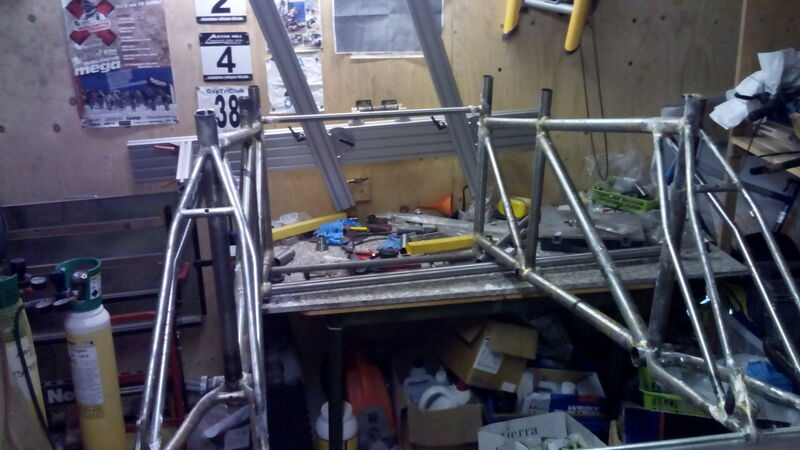 I have only build regular frame and have neve built a tandem let a long a quadra cycle. 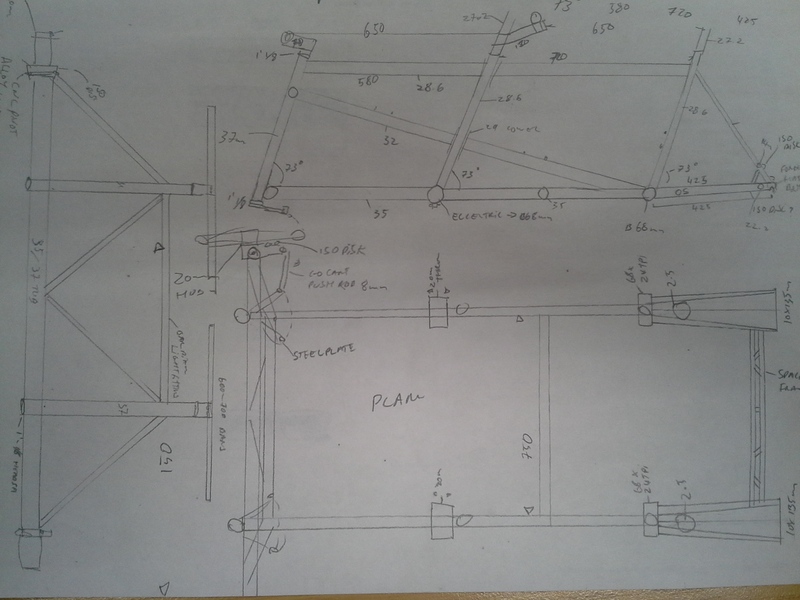 I started with a sketch and some rough dimensions. 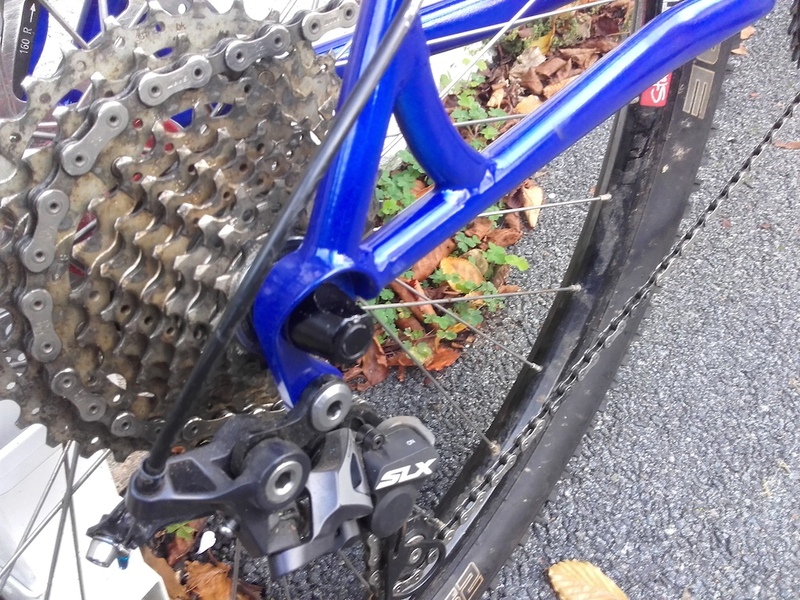 Using Columbus Gara large dimension Cromo tubes and regular MTB parts apart from tandem cranks. The trick is to make it a small as possible but stable and fit everyone on without hitting toes or heals. I got all the metal from peter at Framebuiliding.com he must have wonders what on earth I was building. Then I started building the backends. 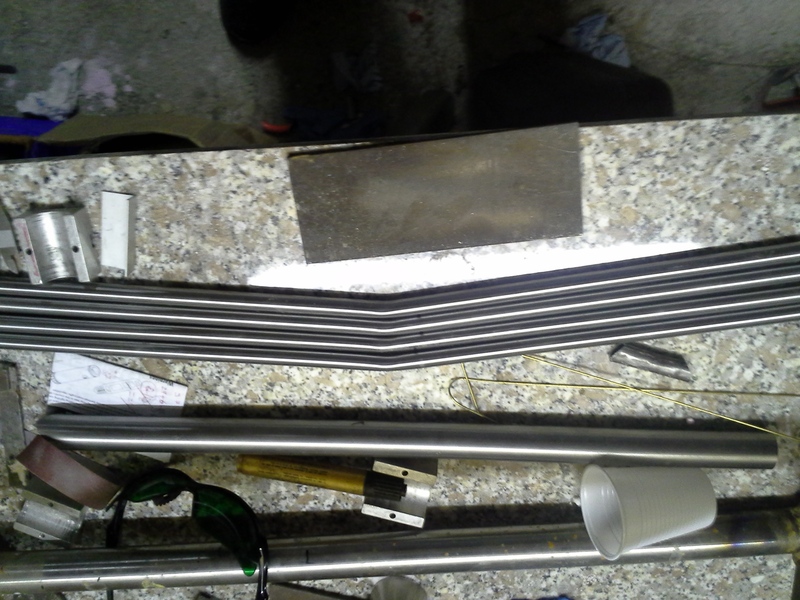 Bending tubes to be as similar as I can. It was a bit tight on space and my flat surface makes it tight to fit it all on and get it straight. So I built two strange looking back ends as the stoker stem comes backwards to ensure the back rides head is not up any ones backside. After hours of fillet brazing But eventually I built one side. One I had two sides it started getting tricky as I had to alight the front end on the flat work surface and then a big supported steel bar through the rear end. I nearly burnt myself a few times moving round the cumbersome space frame while fillet brazing. I got it to the guys at the bike shop and they built the wheels and fitted the kit in a day and it was ready to go. Crazy they did the rock to rock ride that weekend. Reports back was that it was a huge improvement and with a few mods would be amazing. So I was really pleased. I think I might stick to a regular 29er build next time. The colour coat has dried. The decals are on so its ready to go for a top coat. I like to use a 2K top coat n(u-pol 2:1) as it tough and give a good looking finish. Wetted out a bit to make sure it goes on okay. needs to be warm so I have the heaters in the room. One light coat then one full top coat with 15 min in between. Heater on for 3 hours then in the airing cupboard for 24 hours. A quick cut on polish then it’s time to take out all the blanker bolts, tap them and ream the BB and headset. The some frame saver inside the frame so it does not corrode. Some nice customer green bolts. A quick photo then time to pack it up to send it to its new home. Right time to get some colour put down, which is my favorite part. 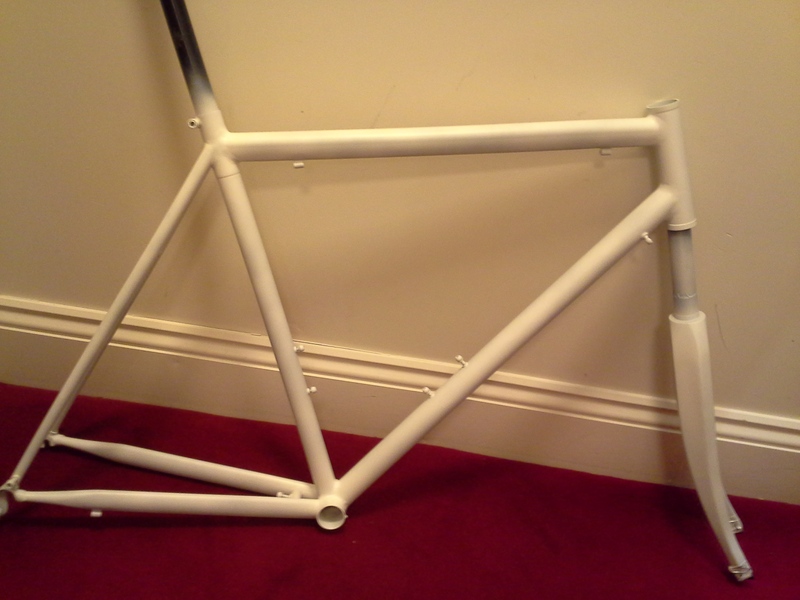 So the frame has been white primed and lights smoothed down. the compressor set to 70psi, the paint wetted out 50/50 with thinners. rooms is warm @ 20+ degrees (3x garden patio eleci heaters going). time to lay down some paint in long strokes. just dusting then filling out with a few passes. the pigment is really strong so you don’t need to put it down thick. 15 mins standing time then one more light pass. This needs to dry for 8 hours then we can put the decals on. peal the backing off and align carefully in one direction pushing any bubbles out. Rub the covering to make sure a goods bond then peal off carefully making sure no edges lift. then lay down the opposing decal making sure it lines up end to end. so it’s beginning to look like the final item. next will be a 2k top coat and then reaming at tapping the frame. So the paint test went well. now it’s time to progress the paint. 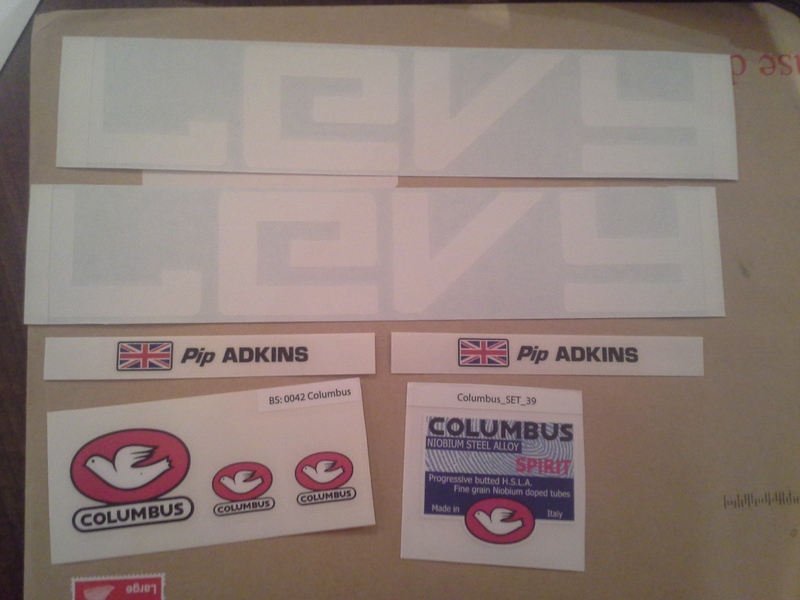 First thing it to orders the decals required. 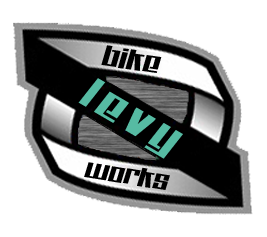 I design them in photo shop then upload them to a website that prints the decals for you. there are some useful guys like gil@thecycleshed.co.uk who can do that for you if you want. I used sunny stickers . The Headbadge decal is on its way and will be here by the time the paint is dry. Before you paint make sure you have enough space. indoors is better and you needs to ensure no dust and good temperature of 18-20 degrees c. I am using a 3hp compressor with a water trap and high pressure low volume air gun like you would use for car paint touch ups. Make sure you have solvent ready to clean the gun before you start. 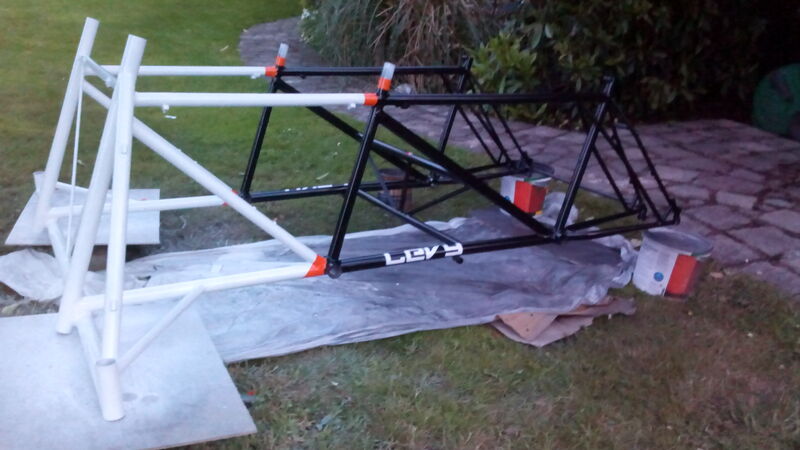 Before you put any paint down make sure you have inspected the frame. blank of any threads you don’t want pain on then key it by sanding with a fine paper all over. and wipe it down the solvent (isoprop alcohol with do or paint solvent), i use a seat pin clamped into a park stand to hold it. I am using a 1k primer wetted out with solvent to a skimmed milk consistency, mix thoroughly a load the gun. then it time to paint with long light strokes until the frame is covered. i like to dust it a few time until here is enough paint to make a smooth surface, go to fare and you get a run. 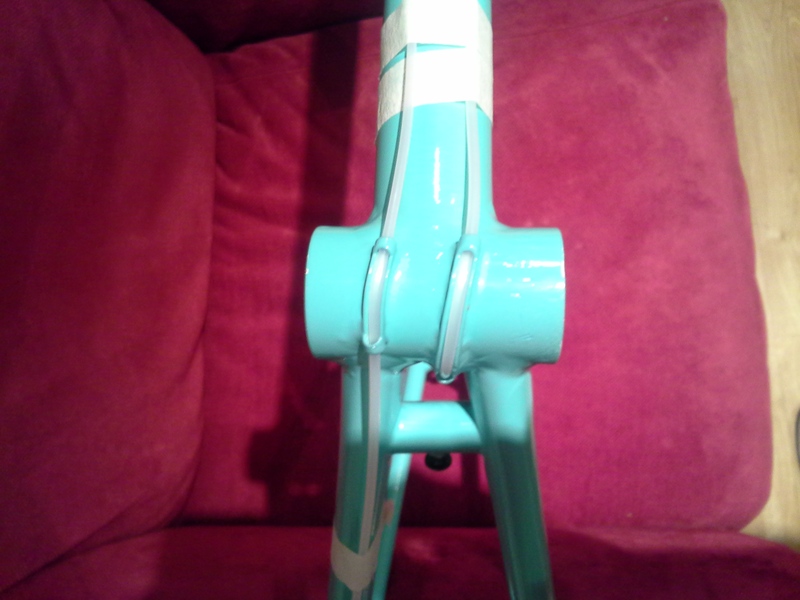 Aim at the hard areas first like dropout , bb and seat tube. You should end up with a fine white surface all over. leave to cure in a warm place (airing cupboards are perfect). once that’s gone off we can then lay some paint down.